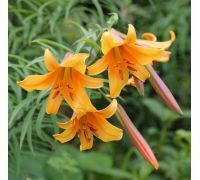 Trumpet lilies present a great opportunity for the afficionados of unusual flowers. Representatives of this group stand out from other colourful lily species and cultivars with their noble flower shapes. If you like elegant blooms shaped like deep, narrow cups with decoratively recurved petals, you will feel like at home in this section. 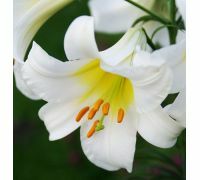 We encourage you to look at the pictures of our lilies and to read short stories about them. There are trumpet lily varieties with blooms in saturated colours, such as the bright orange „African Queen”, dark pink „Pink Perfection” or the citrus yellow „Golden Splendour, available in our garden store. 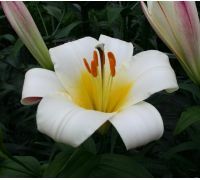 You might also take interest in the absolute classic – the wonderful royal lily „Regale” that produces numerous snow-white flowers with sunny-yellow bases. The decision is up to you. We guarantee that all our lilies come with 100% satisfaction guarantee, because they will bloom long and abundantly on your borders. 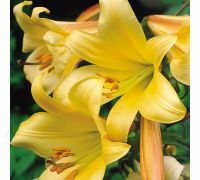 We only sell high quality Dutch trumpet lily bulbs in our store. 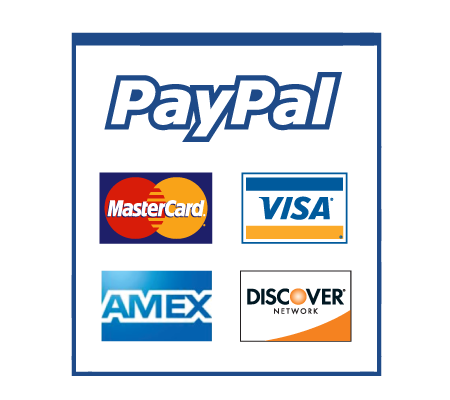 We offer proven, coveted varieties at affordable prices. We made garden shopping so easy in our store – a few mouse clicks would be enough. 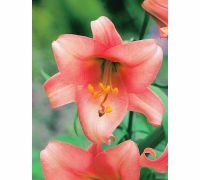 All that you want is awaiting you in one place, but do not forget to visit other lily sub-categories where you will find varieties of all sizes and colours. Enjoy!